In 2002 my friend Dave Gobis, who at the time was the director of the Ceramic Tile Education Foundation (the Tile School) in South Carolina, invited me to attend a three-day training course conducted by representatives of Schluter Systems LP, a company that makes tile related installation products. During the course I was introduced to a number of innovative products, to include the Kerdi® waterproofing membrane, which is used in shower construction, and Ditra®, which is an uncoupling membrane used in ceramic and stone tile flooring applications. “Uncoupling tiled floors from the base that is under them has gone on for thousands of years using cement mortar and sand strata substrates. Ditra accomplishes the task in a modern, high-tech fashion. 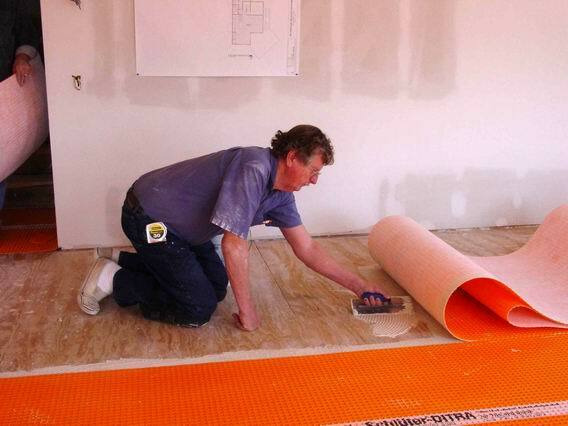 I was so taken with Schluter products that I later approached the company’s management with a scheme whereby they would subsidize the production of a new tile how-to book. 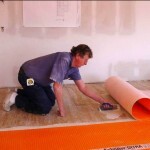 In return I would cover the main Schluter products — Kerdi and Ditra. Tile Your World: John Bridge’s New Tile Setting Book resulted from that arrangement. Installing hard tiles on floors has become problematic given modern (lightweight) construction techniques. The long serving “mud” method is no longer used for the most part. It survives, but in isolated niches. Accordingly, Schluter Systems saw a need and answered it by developing Ditra, which accomplishes essentially the same thing a mud bed does. It prevents the subfloor from exerting its movement forces on the tiled floor above. In the Houston area particularly, where most subfloors are concrete, the ability to isolate the tiles is indeed desirable. As most of us know, concrete floors crack, and when tiles are bonded directly to them bad things can happen. Although there are never any guarantees when cracking is apparent, Ditra goes a long way in preventing problems. I don’t insist on Ditra or any other uncoupling membrane when tiling over concrete floors, but I do recommend it. Adding Ditra to a tile flooring job will cost about $2 per square foot. I think the benefit far outweighs the cost. Using Ditra, normal cracking which occurs in concrete slabs will not adversely affect your tiled floor. There is no out and out guaranty that severe cracking will be accommodated, though. In fact, there are some concrete cracks that nothing can survive. Ditra is also used over wood subfloors in place of mortar, cement backer boards and other tile underlayments. Although ceramic and stone tiles can be laid directly over plywood subfloors, it’s definitely not the best thing one can do. So on wood subfloors I do insist that Ditra be used unless provision has been made (space allowed) for a traditional lath and mortar installation. Lath and mortar (mud) work will only occur in new construction. For additional information about Ditra or any other Schluter product, you can participate in our online forums and ask your questions there.